The basic objective of any Access Control solution is to protect organization assets and ensure human safety by controlling movement of people to pre-defined rules. Matrix COSEC is a comprehensive and flexible Access Control solution to meet any need of any organization irrespective of its size, layout, locations and timings. Matrix COSEC allows controlling access on three simultaneous dimensions – User, Zone and Time by answering the three fundamental questions on Who, Where and When. In addition, a range of value-added features like anti-pass back, 2-person rule, first-in user, blocked users, door auto relock, guard tour, man-trap and smart card based identification ensure foolproof security of physical assets and safety of manpower. 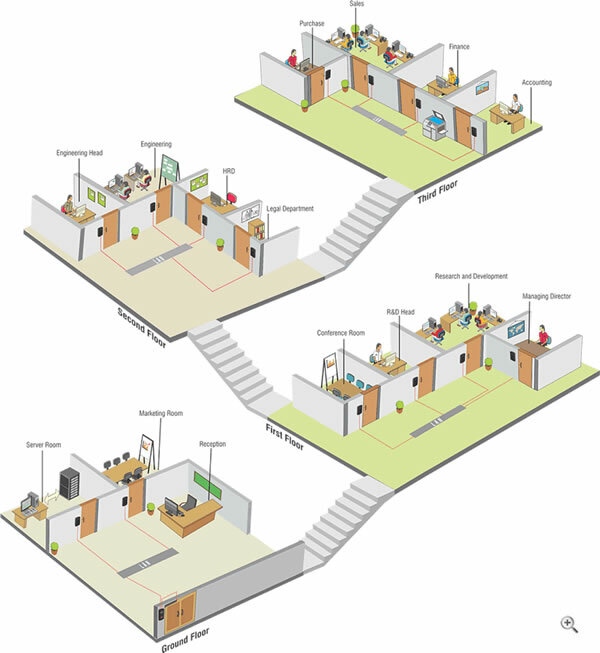 Picture below shows COSEC access control application for a large, multi-floor organization. Different biometric and card based door controllers are shown at various divisions of the organization. COSEC server controls and monitors the entire application.